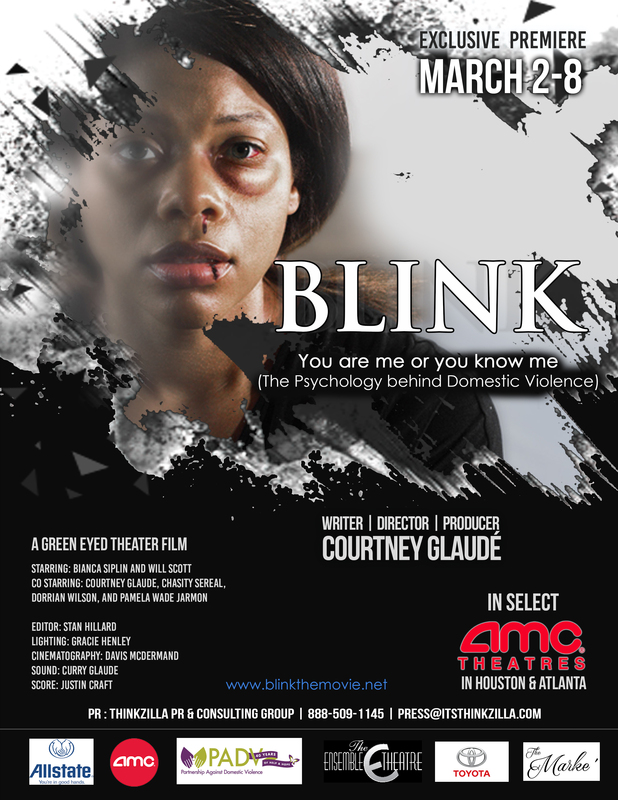 Movie Focusing on Domestic Violence Makes Audiences “Blink"
Courtney Glaudé’s latest movie “Blink” partners with Allstate, Partnership Against Domestic Violence and Toyota to shine light on the serious subject of domestic violence. “Blink” is the latest film project from Houston, TX native Courtney JáPaul Glaudé. The movie was released earlier this year, to industry professionals, at the 2017 Los Angeles Short Film Festival, and is now set to premier in select AMC theaters in Houston & Atlanta March 2nd through 8th. Allstate insurance recently backed the film as an acting sponsor to help shine a light on such a serious topic. Allstate is committed to “Blink” as part of the company’s "Purple Purse" initiative, which is led by spokeswoman Serena Williams with the purpose to help empower domestic violence survivors by offering resources and tools for them to stay free from abuse. Further, the Partnership Against Domestic Violence (PADV) has a “Every 9 Seconds” campaign that piggybacks on the theme of “Blink”, which includes having a spokesperson for PADV attend and speak at a private sneak peek of the film on February 17th. This event will happen at 2pm at The Marke Venue in Atlanta, Georgia. “Blink” is the dramatic story of Nailah Belle as the character tries to navigate the depths and effect of domestic violence. Belle discovers that the calmest seas are often the most turbulent below the surface. From the outside, the meticulous facade of Nailah and husband Chris’s relationship looks perfect. The community doesn’t suspect domestic violence exists in the home, but the violence is unbearable as Nailah seeks out perfection and is looped into a life of a domestic violence victim, showing how everything can change in just one blink.